Here, we call them boba or pearl tea. My Canadian cousins call them bubble tea. They are typically in plastic containers with a plastic seal. You use the straw to stab or poke through the seal to drink it. Many places have either good milk tea or good pearl, seldom both. I’d usually get a milk tea that’s either watered down or taste very powdery and have no taste of tea, but good pearls. Or I’d get pearl that is hard and not chewy, but good milk tea.. However, this place had good milk tea with soft and chewy pearls! Bubble tea, also known as pearl milk tea or boba milk tea, is a Taiwanese tea-based drink invented in tea shops in Taichung, Taiwan, during the 1980s. The term “bubble” is an Anglicized imitative form derived from the Chinese bōbà (波霸) meaning “large breasts,” slang for the large, chewy tapioca balls commonly added to the drink. These are (粉圓, fěnyuán), also called “pearls” (珍珠, zhēnzhū). Bubble teas are typically of two distinct types: fruit-flavored teas and milk teas. However, some shops offer hybrid “fruit milk teas”. Most milk teas include powdered dairy or non-dairy creamers, but some shops also offer fresh milk as an alternative. Ice-blended versions are usually mixed with fruit or syrup, resulting in a slushy consistency. Other varieties are 100% crushed-fruit smoothies with tapioca pearls and signature ice cream shakes made from local ice cream sources. 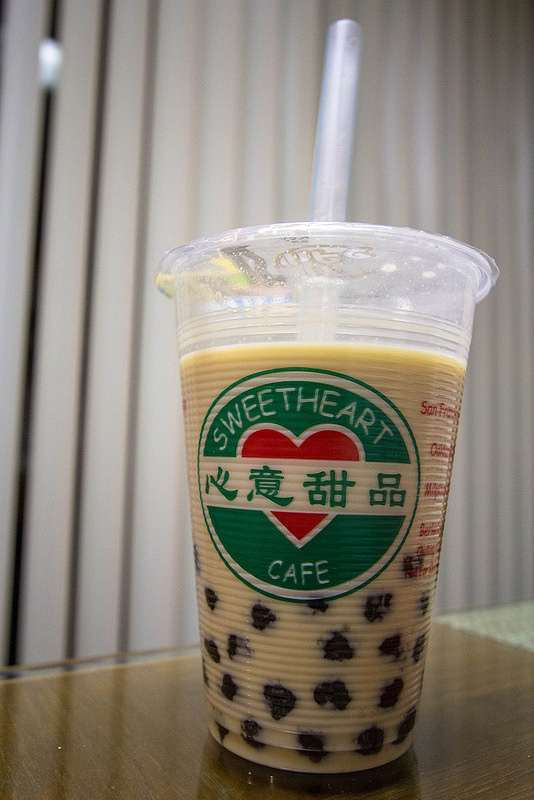 Many American bubble tea vendors sell “milk smoothies”, which are similar to bubble tea but do not contain any tea ingredients. Bubble tea was invented in Taiwan during the 1980s. One possible origin is Chun Shui Tang teahouse in Taichung, where Ms. Lin Hsiu Hui (product development manager) poured sweetened tapioca balls into the tea during a meeting in 1988. The beverage was well received by the people at the meeting, leading to its inclusion on the menu, ultimately becoming the franchise’s top-selling product. An alternative origin is the Hanlin teahouse in Tainan, Taiwan, owned by Tu Tsong-he. He made tea using traditional white tapioca, which has the appearance of pearls, supposedly resulting in the so-called “pearl tea”. Shortly after, Hanlin changed the white tapioca balls to the black version that is seen most today. The drink became popular in most parts of East and Southeast Asia during the 1990s. [Edit on 06.26.2014] Here’s a recipe my friend at Cuppacocoa concocted! She also points out that HK-style milk tea uses condensed milk, whereas Taiwanese milk tea uses sugar/creamer.